Game description: The unique and bizarre gameplay of Katamari Damacy returns in the sequel, We Love Katamari. Your goal is to roll up large balls of anything and everything that that you can find so that you may replace the stars in the universe that were accidentally destroyed. 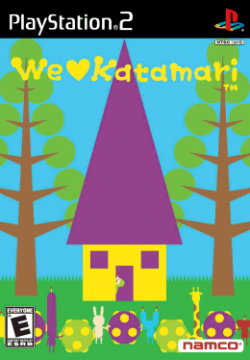 We Love Katamari now includes both cooperative and competitive multiplayer modes. The concept for this game is as idiosyncratic as its predecessor, Katamari Damacy. Since the release of the original game, the King of All Cosmos and his son the Prince have acquired a fan base. The Prince receives a request from a fan at the start of the game. The objective of the game is to have the Prince fulfill each fan’s request, which will make more fans (stages) appear until the whole game is mobbed with fans. The gameplay follows the same core mechanic: To gather material, the Prince pushes around his katamari, a magical, highly adhesive ball capable of grabbing anything smaller than itself. Initially, the katamari can only pick up smaller items like loose change and discarded pencils. As more items accumulate, the katamari’s power grows, allowing it to pick up “vaulting boxes, pencils, erasers, postcards, ramen, robots, cows, sheep, this girl, that boy, moms and dads, bicycles, motorbikes, homes, buildings, rainbows, clouds, islands, hopes and dreams”. Once the level is successfully completed, the katamari is launched into space and becomes a planet, satellite, or other celestial object. If the planet has already been created, the katamari can replace it or be shattered into “stardust”. Widescreen support with .pnatch file from the PCSX2 forums. Description: The outline of the 2D objects are visible if you use the resolution upscaling in GSdx. As if they are poorly joined with a small gap. Workaround: Go to Config -> Video (GS) -> Plugin Settings and choose "Bilinear(Forced excluding sprite) in the "texture filtering" or Use native resolution to remove most of the lines; some lines still visible in both workarournds but changing the HW Hack "TC Offset X" and "TC Offset Y" can correct these remaining lines (for example try 750 and 0, or 500 and 500). Software mode will also remove all lines (but hardware mode causes "No full screen filter effect" issue). Description: There should be a full screen burlap like semi transparent filter in the whole game. Both in the 2D parts and during rolling. Description: When a stage finishes and before the Royal Rainbow, a small slot wheel in the corner will pick a random item in the world to compare with your katamari. There is a small chance (~5%) that this wheel will keep spinning forever, effectively softlocking the game. Description: We Love Katamari have weird speed bug when this speed hack is enabled. Workaround: Go to system and enable automatic gamefixes or Don't enable mVU Flag hack in the "Speedhacks".